The UK HPI shows house price changes for England, Scotland, Wales and Northern Ireland. In England, the January data shows on average, house prices have fallen by 1.0% since December 2018. The annual price rise of 1.5% takes the average property value to £244,567. The lowest number of repossession sales in November 2018 was in the East of England. The highest number of repossession sales in November 2018 was in the North West. Figures for the two most recent months are not being published because there are not enough new build transactions to give a meaningful result. London shows, on average, house prices have fallen by 0.3% since December 2018. An annual price fall of 1.6% takes the average property value to £472,230. Wales shows, on average, house prices have fallen by 1.3% since December 2018. An annual price rise of 4.6% takes the average property value to £160,232. There were 57 repossession sales for Wales in November 2018. UK house prices rose by 1.7% in the year to January 2019, down from 2.2% in the year to December 2018. This is the lowest annual growth for the UK since June 2013, when house prices increased by 1.5%. The UK Property Transaction Statistics for January 2019 showed that on a seasonally adjusted basis, the number of transactions on residential properties with a value of £40,000 or greater was 101,170. This is 1.3% higher compared to a year ago. Between December 2018 and January 2019, transactions increased by 0.8%. House prices grew fastest in Wales increasing by 4.6% in the year to January 2019. House prices in London fell by 1.6% in the year to January 2019. The UK House Price Index (HPI) is published on the second or third Wednesday of each month with Northern Ireland figures updated quarterly. The February 2019 UK HPI will be published at 9.30am on Wednesday 17 April 2019. See calendar of release dates. We have made some changes to improve the accuracy of the UK HPI. We are not publishing average price and percentage change for new builds and existing resold property as done previously because there are not currently enough new build transactions to provide a reliable result. This means that in this month’s UK HPI reports, new builds and existing resold property are reported in line with the sales volumes currently available. The UK HPI revision period has been extended to 13 months, following a review of the revision policy (see calculating the UK HPI section 4.4). This ensures the data used is more comprehensive. Sales volume data is also available by property status (new build and existing property) and funding status (cash and mortgage) in our downloadable data tables. Transactions involving the creation of a new register, such as new builds, are more complex and require more time to process. Read revisions to the UK HPI data. Revision tables have been introduced for England and Wales within the downloadable data. Tables will be available in csv format. See about the UK HPI for more information. Data for the UK HPI is provided by HM Land Registry, Registers of Scotland, Land & Property Services/Northern Ireland Statistics and Research Agency and the Valuation Office Agency. The UK HPI is calculated by the Office for National Statistics (ONS) and Land & Property Services/Northern Ireland Statistics and Research Agency. It applies a hedonic regression model that uses the various sources of data on property price, in particular HM Land Registry’s Price Paid Dataset, and attributes to produce estimates of the change in house prices each month. Find out more about the methodology used from the ONS and Northern Ireland Statistics & Research Agency. The UK Property Transaction statistics are taken from HM Revenue and Customs (HMRC) monthly estimates of the number of residential and non-residential property transactions in the UK and its constituent countries. The number of property transactions in the UK is highly seasonal, with more activity in the summer months and less in the winter. This regular annual pattern can sometimes mask the underlying movements and trends in the data series so HMRC also presents the UK aggregate transaction figures on a seasonally adjusted basis. Adjustments are made for both the time of year and the construction of the calendar, including corrections for the position of Easter and the number of trading days in a particular month. UK HPI seasonally adjusted series are calculated at regional and national levels only. See data tables. The first estimate for new build average price (April 2016 report) was based on a small sample which can cause volatility. A three-month moving average has been applied to the latest estimate to remove some of this volatility. Work has been taking place since 2014 to develop a single, official HPI that reflects the final transaction price for sales of residential property in the UK. Using the geometric mean, it covers purchases at market value for owner-occupation and buy-to-let, excluding those purchases not at market value (such as re-mortgages), where the ‘price’ represents a valuation. 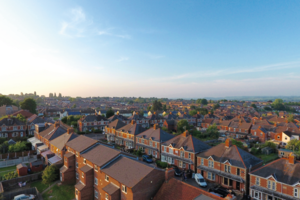 Information on residential property transactions for England and Wales, collected as part of the official registration process, is provided by HM Land Registry for properties that are sold for full market value. The HM Land Registry dataset contains the sale price of the property, the date when the sale was completed, full address details, the type of property (detached, semi-detached, terraced or flat), if it is a newly built property or an established residential building and a variable to indicate if the property has been purchased as a financed transaction (using a mortgage) or as a non-financed transaction (cash purchase). Repossession sales data is based on the number of transactions lodged with HM Land Registry by lenders exercising their power of sale. For England, this is shown as volumes of repossession sales recorded by Government Office Region. For Wales, there is a headline figure for the number of repossession sales recorded in Wales. The data can be downloaded as a .csv file. Repossession sales data prior to April 2016 is not available. Find out more information about repossession sales. Background tables of the raw and cleansed aggregated data, in Excel and CSV formats, are also published monthly although Northern Ireland is on a quarterly basis. They are available for free use and re-use under the Open Government Licence. HM Land Registry’s mission is to guarantee and protect property rights in England and Wales. HM Land Registry safeguards land and property ownership worth in excess of £4 trillion, including around £1 trillion of mortgages. The Land Register contains more than 25 million titles showing evidence of ownership for some 86% of the land mass of England and Wales. Follow us on Twitter, our blog, LinkedIn and Facebook.